What's Behind Glu Mobile's Mysterious 10% Pop Today? There's a rumored very bullish report regarding Glu Mobile that could be driving the stock higher, but here's what investors should focus on. Shares of Glu Mobile (NASDAQ:GLUU), a leading developer and publisher of mobile games with titles that include Kim Kardashian, MLB Tap Sports Baseball, Deer Hunter, and Design Home, among others, are up 10% as of 3:22 p.m. EDT on heavy trading volume. As of the above time stamp, more than 7.8 million shares of Glu Mobile stock have traded hands today, more than three times its 2.4 million average volume, according to Yahoo Finance. 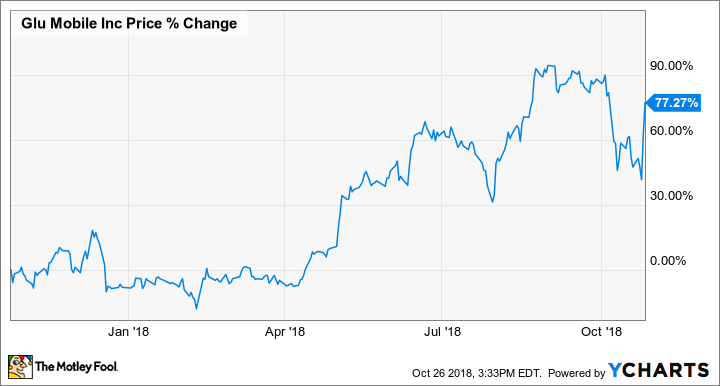 With no direct news surrounding Glu Mobile, the prevailing theory is that a thoroughly bullish presentation from Stansberry Research, a subscription-based publisher of financial information, suggested the stock has more upside remaining, even after its gains over the past year. These types of analyst and/or subscription notes definitely have the ability to move the needle with small market capitalization stocks such as Glu Mobile, but investors should take these pops and drops with a grain of salt. In fact, earlier this month, a report from ROTH Capital analyst Darren Aftahi, which downgraded the mobile game company from buy to neutral, sent the stock spiraling 12% lower -- which was mostly offset with today's move higher. Rather than watching analysts' notes drive the stock price, investors would be wise to take the long-term approach and dig into the company's success, or lack thereof, with its pipeline of upcoming titles. Through the summer of 2019, Glu Mobile will release Titan World, WWE: Universe, and Dash Town, among others. That fits right in with the company's three-year strategic plan that called for studio consolidation in 2017, building and launching its pipeline of games during 2018, and improving margins and free cash flow in 2019.